If you're like me, you're always looking for the perfect lunch or light dinner. I'm always looking for new ways to cook with chicken breast to make it flavorful; truth be told, a lean piece of chicken breast without the skin and bone can often be quite bland. Marinating the chicken in spiced yogurt for a couple hours packs the chicken with flavor as well as tenderizes the meat. This recipe was perfected by Oliver who was inspired by an old Indian cook book my mother found in a remote village in India while traveling a couple years ago. The book eloquently describes yogurt as "the diplomat of Indian cuisine. It is often there, but in the background, seeing that things go smoothly; it is sweet, but - at times - slightly sharp". Toast the seeds in pan (without oil) and toss until fragrant. Then, grind the spices until you obtain a powder. Mix the yogurt, spices, ginger, garlic, curry powder salt and pepper in a bowl. Cut the chicken breasts into bite size cubes and add to the yogurt mixture. Toss to coat all the pieces, cover with plastic wrap and marinate for 2 hours. Preheat your oven to 350F. Remove the chicken from the bowl, shaking off any excess marinade. Place the chicken on the grill sheet that goes in your oven, and place a an aluminum-lined sheet below (marinade will drip down as it cooks). Place the chicken in the oven and cook for 10 minutes. Turn your oven to broil and cook for another 3-4 minutes or until the chicken is golden brown and just cooked through. Serve with warmed Naan bread, a dollop of sour cream, a good drizzle of fresh lime juice and garnish with a small handful of cilantro. Enjoy! i love that photo. i'm not really a chicken-guy, but this shot is changing my mind. I love marinating meat in yogurt, it makes it so tender! This looks really delicious. Justin Schwartz: I hope you get to try it.. it make change your mind about chicken! I know this will sound odd, but I am so thankful for warmed Naan bread. And this my friend is the PERFECT meal to serve on top of warmed Naan bread. I always love your new photos. Y.U.M. I am crazy for lime and cilantro... and just brought a little pot of cilantro home from the store... :) hopefully I can keep it alive. You have a really good blog page and nice photos..
this is look delicious !!! this is look delicious ! Beautiful photo! This looks so delicious. It is funny, but I am seeing so many chickenrecipes today. it must be because I am doing a grilled chicken tonight myself for the first time...:) This looks lovely! I love your photo of this dish- it's convinced me to put this on next week's menu. Looks very good! My mom used to make something like this when I was growing up and I just adored it. I think hers had paprika and cayenne instead of the curry though...but I do recall lots of ginger, cumin and cilatro. Yours looks so beautiful! This sounds awesome!! I love a good naan-wich. I am a sucker for yogurt sauce, and having it with cilantro is intriguing! 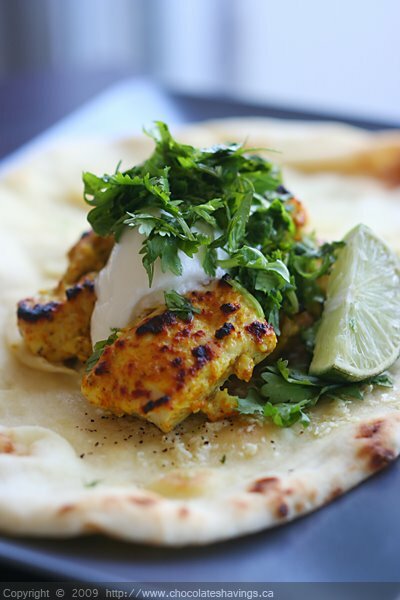 I LOVE curried chicken with spiced yogurt!! yum yum yum!! beautiful pic!!! My husband is a cilantro freak, he just can't seem to get enough so I know he would be all over this dish. He would most likely still ask someone to pass the cilantro! What a great looking dish. It looks very tasty and sounds delicious! That looks sooo good. Spice, cream, cilantro and lime are just a killer combination. It's why I love Indian and Mexican food. That looks fantastic! Love the yogurt idea. you dont know how much I love indian food! and this is a great twist from the traditional ! I cant wait to make it !! easy enough! I made this meal and marinated the chicken over night, which worked out fine. It grilled up lovely and is now sitting happily in my belly - YUM! Jamey: I'm glad you liked it! I worked it into my meal plan for next week because I was craving it again! What a great way to fit a ton of flavor into chicken. This dish sounds absolutely fabulous. I love Indian-inspired dishes. Great job! your photo makes me want to try this. I agree with you - chicken can sometimes be bland, but this doesn't look bland at all! Looks wonderful!! !I guess it tastes even better!!! I love pretty much anything if it involves naan bread to dunk! Sounds great! Absolutely spectacular dish! By far the best homecooked Indian style chicken I've ever managed to cook, many thanks for sharing this fantastic recepie. Geay Varrey: I'm glad you enjoyed it!